倚殿陰森奇樹雙 In the shade of the forest by the palace yielded two wondrous trees. 明珠萬顆映花黃 Flowers looked pale against a myriad of shining pearls1. 不須侍女伴身旁 Need no maid in attendance. These are the poetic lines leading to a tragic scene in one of the most famous Cantonese operas. 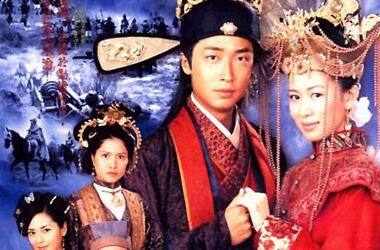 This story takes place at the fall of the Ming Dynasty. Princess Eternal Peace had been betrothed to a young scholar official for a few days just before the peasant revolt of Li Ji Cheng (李自成) broke out and the palace was overrun. Before the last Ming Emperor committed suicide by hanging himself at Coal Hill, he killed off his family with sword in hand. However, the Princess survived her wounds and was rescued. She became a nun but was later discovered by her betrothed in a chance meeting at a nunnery. In the meantime, the revolt had been crushed by the Manchus who had established the Ch’ing Dynasty. In order to pacify the people and lay legitimate claims to the mandate of Heaven, the Ch’ing Emperor was eager to adopt the former princess as his own. The Princess insisted that the Ch’ing Emperor acquiesce to three conditions before she agreed to become his adopted daughter – that he must order the imperial funeral rites to be performed that were due her late father, free her imprisoned twelve-year-old brother, and be able to retain her formal attire of the previous dynasty. The Princess further stipulated that on her wedding night, the ceremony was to be held in the imperial gardens. There the lovers took poison to escape servitude to the new regime. Like all Chinese tragic love stories, the lovers are depicted as immortals banished from Heaven for violating the heavenly law of falling in love, i.e. having carnal desires2. The following is the translation of the Cantonese lyrics set to a popular folk song that was sung at the ill-fated wedding night scene. This is just a story loosely based on historical events. In actuality, Mukden was still the capital of the Manchus. The founding Emperor did not enter Peking. His son, the Emperor Shun Chih was 7 or 8 years when he sat on the dragon throne of China and not a middle-aged ruler as depicted in the opera. The lyrics in blue are to be sung by the Princess Consort, those in black by Princess Eternal Peace and in red to be sung together. My next translation project is a set of alternate lyrics for this popular Cantonese. It is a warning to those who do not study hard that their future is nothing short of poverty and squalor. Let a cup be the respects paid on the Phoenix Terrace. Take my life as thanks to my parents. I see his tears burdened in hidden sorrow. Yearning for the physical love and abandon our journey to the Yellow Springs3. Mandarin duck lovers embracing in each other’s arms. There we can look for that bright lane of no upheaval once more. Alas the flower lover is willing to be buried with me. Difficult it is for the Princess Consort to drink arsenic on this night of flowers and candles4. In boundless gratitude I give thanks to my late liege. Kneeling together with my wife, I inquire how His imperial Highness is faring in the underworld5. Spending a lifetime together till our hair turns white. But who would want to see wedding candles turning into tears of blood. Let us fulfill our obligations and respectfully kneel before the flower candles4. Future generation shall sing of praises to Princess Consort’s spiritual tablet. 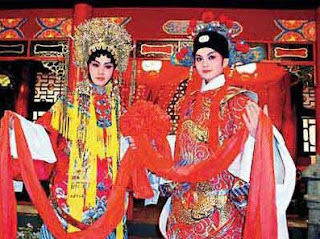 The Princess Consort of the Ming Dynasty will now take a look at his bride7. Deep into the night, give me the excuse of pricking the wick8 for a peek at her. But the phoenixes will always be in love. In tears as we drink these grapes dripped in arsenic. In our midst of joy and drunkenness, let us dream of home. Clinking our cups together, we shall now set foot on the night terrace. Let this Princess Consort be the ornament10 to this tomb. In the tree a pair of branches will reveal the fragrance of Princess Flower. Will always be with her sincere lover. As husband and wife die, the trees will take on their forms11. 1. The shining pearls refer to the crown the Princess is wearing. The brilliance of the jewels made the flowers look pale and yellow. 2. 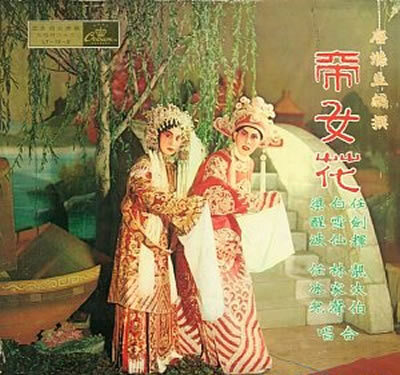 In the movie version of the opera performed by the same actresses, the lyrics of the melody were changed so as to explain the lovers’ tragic fate. He was the golden boy and she was the fairy in charge of scattering flowers. I was able to get hold of the lyrics for the movie’s end. Immortal abodes mistaken for the Lunar Terrace. Once more in the golden Audience Hall, she returns to her original position serving the Jade Emperor. 3. Yellow springs is a euphemism for Hades. When digging a well, the color of water is yellow at its deepest level. Also known as Nine Springs (九泉) because there are nine levels in Heaven and so on earth there must be nine levels as well. Chinese Hades is below that 9th earth level. In the original text, 泉壤–'spring soil’ was used instead to refer the land of the dead. 4. Night of flowers and candles – the wedding night. A table is prepared for the newly wed couple to feast in their room. A pair of elaborately carved red candles are burning together side-by-side on the table. This is used to symbolize the new life the couple faces and that they both may have the same life span like the candles. 5. 請安 – inquiring about the health of one’s parents or superiors. It is a daily filial ritual in old China. In this case, of course, the father, the Ming Emperor, is dead. However, since they are about to meet in Hades, it is still a compulsory ritual for them. 6. Hibiscus drapes is nothing more than a flowery description of drapes surrounding a Chinese bed which resembles a tiny room in itself. 7. The bride is covered by a red veil and the groom will flick it up to see his bride. A formal ritual that he has accepted her as wife. 8. There are no electric bulbs in the old days! One has to prick the candle wick up to make the room brighter. What is meant here is for him to have a better look at her. 9. During the private moments in the bed chamber, the husband and wife go through a ritual of kowtowing to each other as a sign of mutual respect and finally a toast by exchanging their cups of wine raised high to their eyebrow level to pledge their love and fidelity. 10. 珈 is an ornament in women’s hairpin. So I guess Princess Consort is comparing himself to this kind of ornament to signify that he will never be parted from the hairpin representing Princess Flower. 11. As indicated in the introductory poem that there are two strange trees in the imperial forest. wrote the following. I had to repost it here since she has no access to this blog from Mainland China. I read your excellent translation of “帝女花”. It’s really so neat! I have been falling in love with this Cantonese opera. Thanks to you，otherwise I couldn’t know such a beautiful opera! I had a thought afterr reading it. If you don’t mind I want to share it with you. ^ ^I think the flower here is not the true flower. “花黄” is a noun. It’s a kind of facial decoration of females in ancient times. “花黄” is also called as花子, 额黄, 鸭黄, 约黄and so on. It is made from glossy colorful paper, silk, mica, wings of cicada and dragonfly etc, which is dyed into golden, shiny red or green. It is cut in the shapes of flower, bird and fish, and affixed on the forehead, dimples, corners of mouth and temples of females. Females in ancient times also dyed their foreheads with goldon dye because of the inspiration they got from goldon buddha. “花黄” started to be popular in the Northern and Southern Dynasty. There are many versions about its original, but can’t be proved. It appeared in a famous poem (also is a folk song) “木兰辞”. Here is the sentence from that referring to it: 当窗理云鬓，对镜帖花黄. (Facing windows to comb my hair, affixing “花黄” before mirror.) This girl was making up then. “花黄” was quite popular in Tang Dynasty. We can see many pictures of female affixing “花黄” in their faces of that time. I think this line expresses the meaning that the shine of pearls on her wedding crown shine upon her “花黄”（or her charming but pale face）. I quite agree with your translation of “looked pale”，I think she was sad and looked pale in her face at that situation. It is my understanding about “花黄”appearing in this opera, maybe not right.＾＾Hope to communicate more about it with you. At last, I want to appreciate for your excellent translation again. Good day! In my orignal interpretation, 花黃 means the paleness demeanor of the princess. The word yellow (黃)is used as a humility to refers to one's wife as in "the yellow (withered) faced grandma", 黃臉婆. So figuratively, the princess looks yellow (pale)compared to the brilliance of the jewels in her crown. This is understandable since she the day before she pleaded her taxing case in front of the new Manchu ruler. Yes，it's so pity that I can't see your articles in time. I have a crosswall software, but it doesn't work some times before. It makes me depressed. Look forward to seeing your new articles! It's very tricky to use metonymy here. Excellent! Difficult it is for the Princess Consort to drink arsenic on this night of flowers and candles. You translated “奇樹雙” as two wondrous trees. When I saw 奇樹雙 at first sight, I remembered a kind of tree called 合欢树，but the trees here are not合欢树.They are camphor trees. Why they are wondrous? The following are the lines in the first scene describing the these two trees. “合抱”！It is a discription of personification. Their trunks stand quite close, their branches cross in the air. Look like they embrace firmly like lovers. That is the reason why they look wondrous, but I can’t read this layer of meaning in your translation. I think someone read this poem at first time and don’t read the whole script may be curious about why they are wondrous, so you maybe need a revision. ^ ^　Ｉｗant to call they 双生树，which sounds poetic. I got the inspiration from the name of 双生花，do you know it? The trees' branches cross in the air, like the lovers’ fate tired together firmly. What would you translate 双生树 as? I think it uses a special usage of ancient Chinese language, which we call it 宾语前置. ( The objects generally follow verbs, but in ancient Chinese they precede verbs.) 树 is the object of 同 here. The sentence should be夫妻死去也同樹模样 in current Mandarin. In this case, the line express that they will be right at sides of each other in the Yellow Spring( Wherever the princess is, her consort will be there, he will accompany with her all the time.) , their love will continue in the underground and their fate will go on being tired together as well. ( Like the trees accompany with each other, and their “fate” are tired.) It made me remind a saying “你若不离不弃,我必生死相依.”. It fit this situation so much! What did you mean “the trees will take on their forms”? Did you mean the trees will be the same as before however whether the lovers die or not? I haven't written down others thoughts yet. Hope to continue to discuss them with you. ^ ^　Ｉｔ's time for me to sleep. Good night and Good moring to you. Your points are extremely well pointed out. What we had in mind are totally in agreement, just a different way of expressing it. You are translating more figuratively than my more literal interpretation. The trees because of their shapes are wondrous forms to the lovers. Wondrous also mean "extraordinary". This is the meaning here. In my translation, I have two restrictions or constraints that I have to follow, to give an exact translation as possible without sacrificing the intent (for students learning the languages) and that it must sound plausible to English ears. Hence the need for many footnotes. At the same time, I am only translating the poetry without regard to the incidental background for more information. It is to make the reader more curious and to find out more detailed information. My interpretation is that the princess and consort wish to be like in the forms of the lover trees when they die. You are again correct on 难为 as sorry. However in English, the word does not sound poetic enough. Sounds too colloquial and slangy. Hence I use the word "difficult" instead. I am cutting and pasting our discussion on my blog. It is really a shame that you can't access it. Yes, facial decorations are no longer in vogue by the Sung Era as one can see on the ancient paintings. The Sung times are more conservative than the Tang. The Ming is repressive and the Chings have their own non-Chinese fashion. In translating poetry, it is like a striptease show, one cannot revealed everything but to let the reader imagine what is going on. Sometimes the images invoked are totally different from those of the poet. This is because of the terseness of the piece. Hence the need to have tons of footnotes.